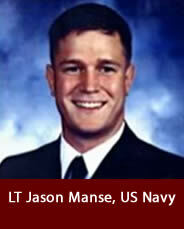 Lt. Jason S. Manse, U.S. Navy, age 30 of Pensacola, FL, passed away January 10, 2006. He died in a tragic plane crash while training student navigators in his job as a U.S. Navy flight instructor. Manse was born on March 22, 1975, in Canton, OH to Ron and Cindy Manse. He graduated from St. Mary’s Grade School and Canton Central Catholic High School. Manse distinguished himself as the class salutatorian while also earning many other academic & athletic honors. He attended Duke University on a Naval Reserve Officer Training Corps scholarship and graduated in 1997 with a Bachelor of Arts degree in history.